Merry Christmas everyone – I’m late to the party as usual for in A Vase on Monday; I’ve been wiped out with flu all week confined to bed, which messed our Christmas plans a bit. It feels a bit odd writing about lavender at this time of year – it has been a very odd year in many ways – and I don’t just mean the weird weather. I’ve been back at work over a year, in a new role too, but it takes just about all my energy to do my job and run the basics of life – hence my rather intermittent blogging. Thank goodness for my Chap who is truly wonderful and takes care of me every day. Lavender is one of my favourite plants – I adore its scent as well as the flowers. I have about 15 plants around my sunny, front garden – varieties include Munstead, Hidcote, Vera (White) – They thrive in the fairly rubbly soil. I’ve got some other lavender in the back garden in pots on the deck – under the conifers that overhang from my neighbour’s garden. So as you can imagine I was thrilled to find some still flowering in December – despite the very wet and windy weather we’ve had in Manchester. I picked these on 23 December 2016. I’ve written about lavender quite a few times on the blog, but I think this is the first time the flowers have appeared in a vase alone. Spring – daffodils and a lavender project – 21 February 2015 – a very early blog post about a dried lavender sewing project. and lavender appears on my very first blog post too – I waited a long time for a garden of my own well into my 40s – 12 February 2015. It won’t surprise you that lavender will be integral to our wedding flowers in Sept 2017. The other plants lurking at the bottom of the garden are the remnants of the blackberry and raspberry canes – which reminded me to hunt out my last jam jar for the photos. As usual, I am joining in with Cathy from Rambling in the Garden who hosts this link up – she has a simple, beautiful, vase of snowberries and rosehips – it looks very wintry and festive. I do love looking at flowers, plants and vases from around the world – it definitely brightens by days – and my mission for next year is to pick, photo and post more often about the plants from my garden – and be more prompt on Mondays even though Cathy says it doesn’t matter if I’m late. I put blackberries and apple in first in my maslin pan, added the raspberries and blueberries and topped up with redcurrants. I added the sugar slowly and ensured it melted first, then added a bit more. I simmered and stirred, everything slowly stunned to mush. Keep going til you get a ‘rolling boil’ – the liquid went darker and the bubbles look thicker. I’ve also got a jam thermometer but i prefer the plate method. My chap ladled the jam into the jars – jam funnel much easier. Jars and lids were washed and ‘cooked’ in oven to sterilise them. I’ve made chutney for years but jam is MUCH quicker to do. If you’re wondering why I picked a Pinkster gin bottle – it’s because it’s flavoured with raspberries 🙂 and these bottles are from gin explorer boxes that come monthly for my Chap from me. It’s a really great way to try out new gins. The Christmas gin fairy might just have brought a full size bottle too – shame I’m still feeling far too rough to drink anything apart from peppermint tea. But it’s not all been bad, I’ve been checking out wedding photographers. I’m on the mend slowly, but that’s been the recurring theme of 2016. I hope you’ve all have a lovely, relaxing Christmas break and that 2017 is a really good year for you. *I wasn’t asked to write about ‘gin explorer’ and I pay full subscription price for each box. 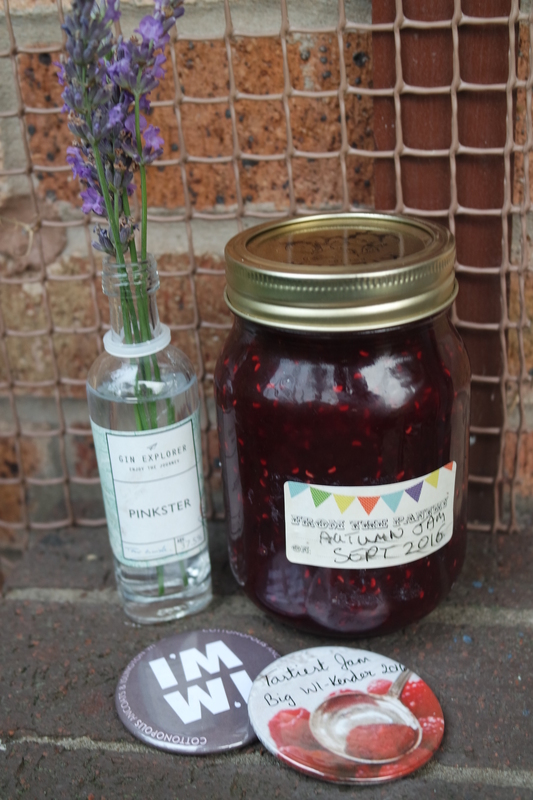 This entry was posted in Gardening and tagged gin, Jam, lavender, pinkster, raspberries, recipe, Women's Institute on December 14, 2016 by Bec - views from my garden bench.